Electric string trimmers are powered in one of two ways. Corded electric string trimmers require extension cords, while cordless electric string trimmers run on battery power. Gas-powered string trimmers are made for large lawns that need heavy trimming. They're capable of easily mowing down thick weeds and other brush, which makes them the top choice of landscaping professionals. All gas trimmers are available with either 2-cycle or 4-cycle engines, which make them versatile enough to handle almost any job. 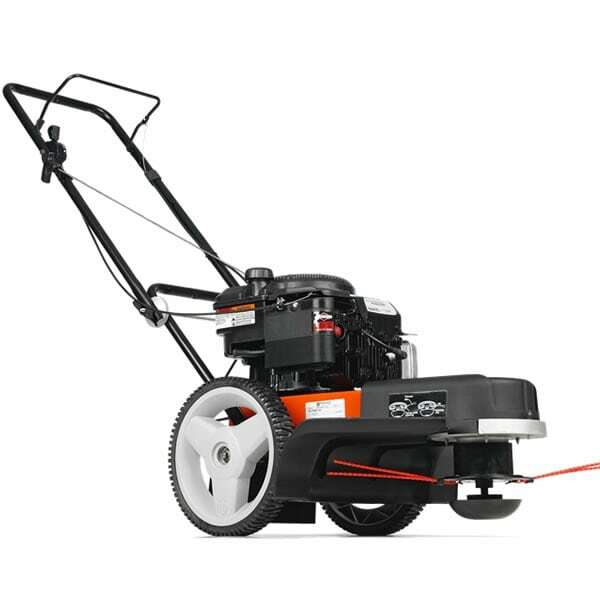 Thanks to their pull-string recoil starts, these trimmers offer a lot of familiarity – many people find that they operate almost like lawn mowers. But walk-behind trimmers are built to tackle thick brush. All you need is plenty of replacement line on hand, and you’ll be trimming like the pros in no time. Brush cutters are the big brother of string trimmers, sporting bigger engines, thicker line, and even powerful metal blades for cutting through thick brush and weeds. If your string trimmer's been struggling to keep up with your workload, you might benefit from stepping up to a brush cutter. String Trimmer Buyer's Guide - Find out How to Pick the Perfect String Trimmer. Our string trimmer how-to library can help you pick the perfect electric string trimmer, gas string trimmer, walk behind string trimmer or brush cutter.